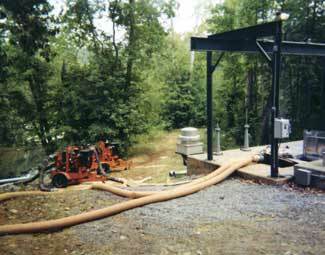 Two Godwin CD150M Dri-Prime diesel pumps; six-inch pumps were selected due to limited access to the site. 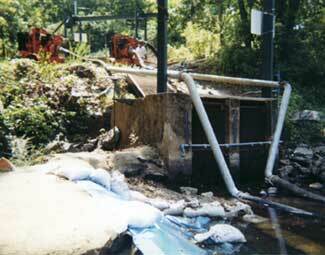 Drought conditions caused the water level in the Rapidan River to drop below the intake, causing vortex problems with the cutomer's existing permanently installed submersible pumps. As a result, flows dropped. A maximum 2,000 gpm was required to overcome the problems, plus the length of suction lines needed to access the deepest point of the river was approximately 100 feet. The Godwin Dri-Prime proved to be a successful solution and the customer has retained the pumps as there is no relief in site to the drought emergency.